Level 1-1 is the first level of Mario Toy Company in Mario vs. Donkey Kong, and is subsequently the first level of the game. The high score for this level is 27500. 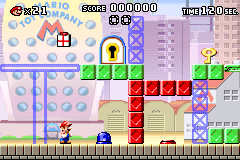 The level opens with an explanation showing Mario jumping onto a Color Switch and grabbing a Key to unlock the door. In the first area, the player needs to jump onto the blue Color Switch to make a red wall disappear. They then to jump onto the red Color Switch to make the blue wall disappear, gaining access to a Springboard and a "Help" box that shows the player how to use it. Using the Springboard, the player can grab the Key and take it to the locked door, entering the next area. 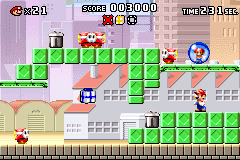 In the second area, there are four Shy Guys that can be defeated using the Garbage Cans. By climbing the ladder on the left side of the area and moving back to the right side, the player can collect the Mini Mario. Alternatively the player can get to the Mini Mario simply by performing a Backflip at the start. Red: In the first area, above the blue platform next to the locked door. Yellow: In the first area, next to the Key. Blue: In the second area, above the first Shy Guy. This page was last edited on April 14, 2019, at 15:38.